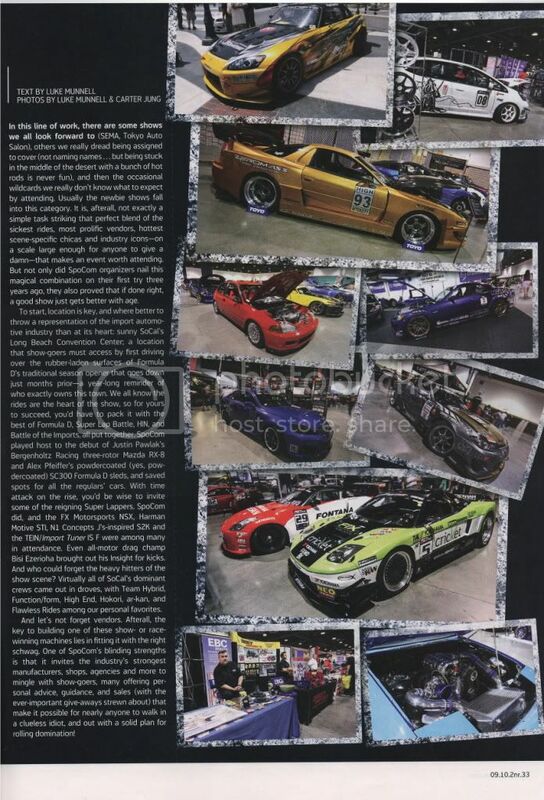 In Import Tuner October 2009 issue, pgs. 032-035, there is an article about SpoCom Show 2009 in Long Beach. The title of the article is "The Continued Rise of the SpoCom Show." Import Tuner wrote on pg. 033, "Virtually all of SoCal's dominant crews came out in droves, with Team Hybrid, Function/Forum, High End, Hokori, ar-kan, and Flawless rides among our personal favorites." Guess what? Team Hybrid not only took home Best Team Overall Quality 2nd place for the 2nd year in a row as well as Best Team Display - 3rd place along with 2 other individual trophies, Import Tuner named us first in their article as SoCal's dominant and favorite teams. A decade plus together with IT and our relationship continues to grow stronger. Look out in the near future for one of our up and coming super stars to be in a full blown feature. ps. Lets not forget to congratulate two of our lovely Hybrid Hunnyz, Sophia Lin and Jasmin Pacheco for being selected and making it on the opening page 032 of the SpoCom Article.